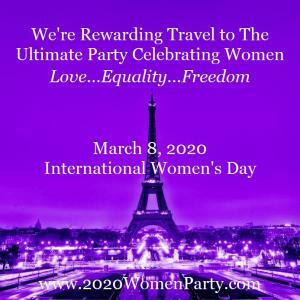 Fun Travel Reward Launches "The Ultimate Party Celebrating Women in Paris"
Recruiting for Good is on a fun mission to help fund summer camp; and is rewarding participation with party travel to Celebrate 2020 International Women's Day. SANTA MONICA, CA, UNITED STATES, April 5, 2019 /EINPresswire.com/ -- Recruiting for Good a staffing agency on a mission to help fund summer camp scholarships is rewarding participation with exclusive party travel. Join to help kids and enjoy fun trips; we're rewarding the Ultimate Paris Party Weekend Celebrating Women. According to Recruiting for Good, Founder Carlos Cymerman, “Our exclusive Paris Party Weekend is perfect for busy professionals (men and women) who love to have fun getaways, make a difference, and see the world for good." 1.One round-trip coach flight; departing from the US on March 5th (Thursday), and returning on March 9th (Monday). Must participate by July 1, 2019 to earn reward; to sign up email carlos(at)recruitingforgood(dot)com. Carlos Cymerman adds, “Invite your friends to participate in Recruiting for Good, help kids and enjoy fun trips to Party in Paris and Celebrate Women."